...where can you take your Davrian next? Just been informed that Thruxton are holding a 51st anniversary meet next year on the 1st and 2nd of June. Again, we are all invited. Thought I'd give everyone plenty of notice so we may be able to get a good number of cars there. be there. and the davrian of course. 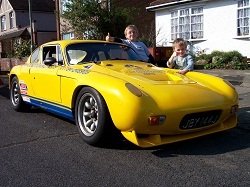 A tentative yes from me and dad, but it might depend on if I can bring a "support" car to share on the club stand. Dad's knee won't last the day so we'll need to bring his mobility chair (which obviously won't fit in the Davrian). He'd either bring the Husky (so there's an Imp connection) or the Ital (another classic in it's own right). So hopefully neither of them would look out of place on the display. For those that don't know Colin and I, no laughing please at the mention of a Morris Ital Please save your judgement until you've seen it, as it is a wolf in sheeps clothing and quite a showstopper. You don't see many 2.0 16V Twin Cam Marinas! Hi Graham. Be really good to see you there. Hope you will be able to make it.